Yes, there is a "right" way to hold a chef's knife. Properly held, your knife will be much more stable, safe and comfortable - trust me, your fingertips will thank you. 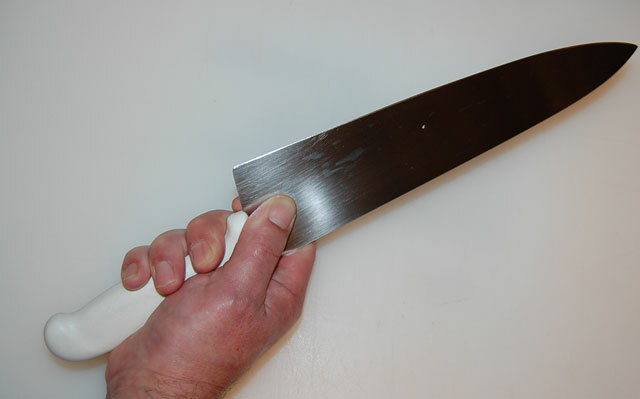 The photo below illustrates the proper way to hold a chef's knife as seen from the underside of the grip. Notice that the knife handle rests in the nook between the meaty sides of your palm (touch your pinky and thumb together if your unsure of what I mean). This hold gives you much more strength when bearing down on the cutting surface while at the same time minimizing stress to the wrist. The other key part of the grip is to pinch the blade firmly between thumb and forefinger with the remaining fingers jammed up tight against the end of the handle or blade bolster (this one doesn't have a bolster). Holding the knife firmly in this manner gives your knife stability in all directions and will prevent it from slipping no matter how slick or greasy your hands might be, eliminating a major cause of cuts. Of course none of this does a damn bit of good if the fingers of your other hand are under the knife's business end, so always remember to grip the food in a birds claw grip leading with your knuckles as shown below. Though this is more awkward and difficult than proper knife grip, it really helps decrease wounds. This is so important that I once worked for a chef who would rap your hand with his knuckles HARD if he saw you holding the food fingertips first. The only thing the proper knife grip will do if you hold the food incorrectly is make sure you cut the finger neatly off, which also prevents it from getting in the way later, so you decide.